Cette très jolie longère est d’une propreté exemplaire, très bien équipée et décorée avec beaucoup de goût. Le jardin, très bien entretenu et très agréable, a fait le bonheur des petits et des grands. Tout comme la piscine. La vue dégagée est splendide et apaisante. Nous étions parfaitement au calme, tout en disposant de tous les commerces dans un rayon de 5km (voiture indispensable). Les propriétaires sont très sympathiques et arrangeants. Merci ! We greatly enjoy our recent stay with our family this summer. 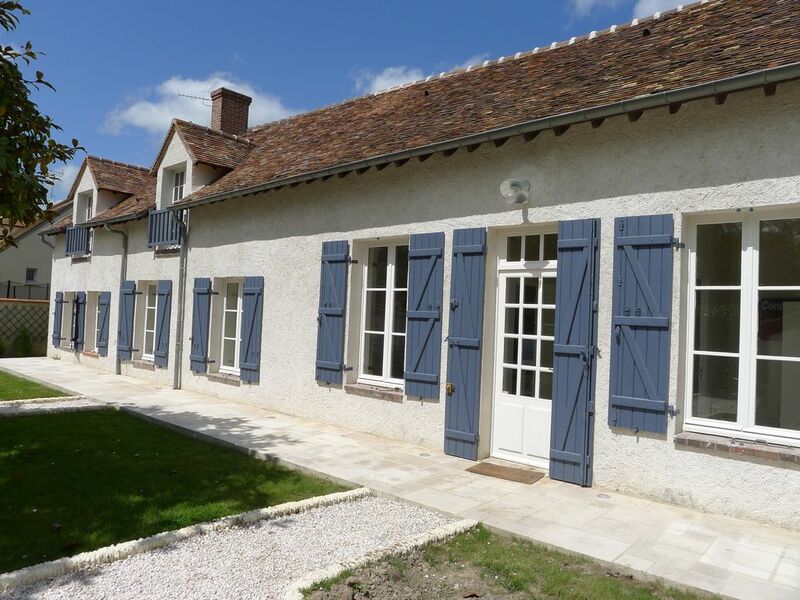 The property is conveniently positioned in a beautiful region surrounded by countryside, woodland, very pretty villages and close enough for a day trip to Paris. The property is picture postcard, with whitewashed walls and blue wooden shutters. The land is fabulous as it offers a larger relaxed seating area, outdoor dining, a terrific heated pool and the cherry on the cake...a private ‘pond’, large enough for the children to row a boat around, whilst spotting frogs, dragonflies and other wildlife! Real Swallows and Amazon’s stuff! A well equipped, stylish and comfortable property, with everything you could want and more, from toys and books, Apple TV and dvds, to bikes and a rowing boat - you’ll find more than you’d expect! We found lots of great restaurants in the nearby towns and villages as well as a tabac and the restaurant and wine shop Chez Erwan, which is a 10 minute stroll down the quiet country lane. The local town of Houdan (5-10 mins in the car) has a train line that runs trains every 30 mind or very hour straight into Paris which take 50 mins. Perfect! The host was very helpful and replied with a couple of queries immediately. She was very friendly, had lots of recommendations and made us feel very welcome. Thank you Vanessa, you are welcome anytime !